Mother’s Day is next weekend and I’m on the hunt for ideas on what I’m going to do with my kiddos. I like to do something simple with the kids that they can take home for their moms or a special woman in their lives. I’ve done a few different projects over the last few years, and thought I’d share them here with you. A few years ago I created this cupcake craftivity. It’s simple, but it’s a cute way that students can write how important their moms are to them. I also love it because it can easily be turned into a bulletin board or hallway display before it’s sent home. I’ve updated the fonts a bit since I made these but the general appearance is the same. I left the template pretty much blank so that students could decorate how they would like. I love to see the variety of ways they choose to make their “cupcakes”. These sprinkles are adorable. You can get this Mother’s Day Cupcake Craftivity for free from my TpT store HERE or by clicking the cover below. 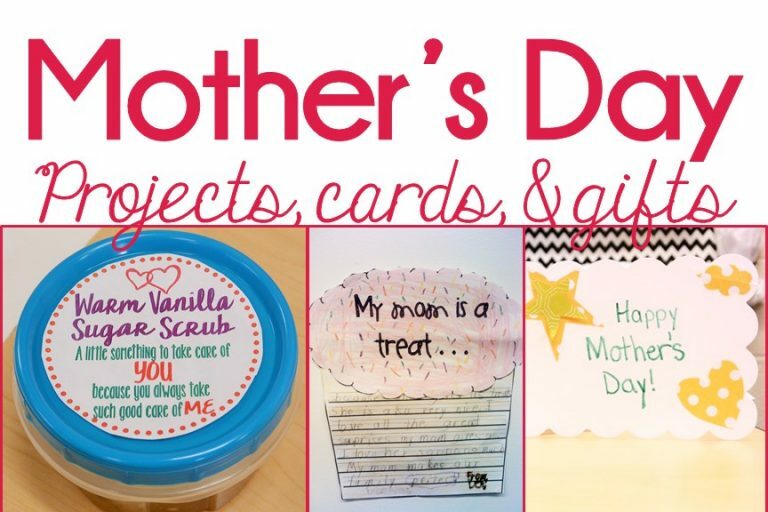 I’ve also had my students make cards for their moms using Ellison dies. We increased the “gift value” by adding IOU’s the cards. I always have left over school pictures so they were perfect to add to the cover of the cards- and the picture frame die just helps set everything. To see how we made them, click the picture below to head to my post on the Ellison blog. Another gift I’ve made a few times is a Warm Vanilla Sugar Scrub. It’s relatively cheap to purchase the ingredients and comes together pretty simply if you’re able to dedicate a couple hours and a table to the project. My kids loved using measuring cups- something many of them had never done before- and they loved having a gift that spoiled their moms. You can read more about the sugar scrub process and the ingredients in my blog post about it. Just click on the image below. One note, I always ended up needing to add extra sugar than the recipe calls for. I just eyeball it; it’s not an exact science. Another year, when I was in first grade, we made flower paintings using watercolors and Sharpies. I then bought a cheap frame for each kid from Dollar Tree and we framed them. They turned out great! Made these watercolor flower bouquet paintings as Mother’s Day gifts inspired by @primarilyspeaking and I love them. I let the kids choose all of their colors and sent them on their way. I love that so many of them styled the background.